Wrestling is the act of physical engagement between two unarmed persons, in which each wrestler strives to get an advantage over his opponent. Physical techniques which embody the style of wrestling are clinching, holding, locking, and leverage. Avoiding potentially lethal techniques, wrestling has aspects of ritual fighting, but its basic principles are closely related to those of military hand-to-hand combat or self-defense systems. Many styles of wrestling are known all over the world and have long histories, and sport wrestling (particularly amateur wrestling) has become an Olympic sport. Wrestling made a name for itself while history was still young in Ancient Egypt, Ancient Greece, and several smaller countries. The concept of wrestling dates as far back as 3400 B.C.E. In fact, origins of the sport can be traced back 15,000 years to cave drawings in France. Early Egyptian and Babylonian reliefs depict wrestlers using most of the holds known to the present-day sport. In ancient Greece, wrestling occupied a prominent place in legend and literature; wrestling competition, brutal in many aspects, was the supreme contest of the Olympic Games. The ancient Romans borrowed heavily from Greek wrestling, but eliminated much of its brutality. During the Middle Ages, wrestling remained popular and enjoyed the patronage of many royal houses, including those of France, Japan, and England. The Mahabharata, one of the major Sanskrit epics of ancient India, describes the encounter between the accomplished wrestlers of Bhima and Jarasandha; "grasping each other in various ways by means of their arms, and kicking each other with such violence as to affect the innermost nerves, they struck at each other's breasts with clenched fists. With bare arms as their only weapons roaring like clouds they grasped and struck each other like two mad elephants encountering each other with their trunks." The popular folk wrestling style of India performed on a mud surface called the akhara follows the Indian tradition. Shuai Jiao, a wrestling style originating in China, is arguably the most ancient of all Chinese martial arts, with a reported history of over 4,000 years. (The date may be legendary, but wrestling was reportedly used by the Yellow Emperor during his fight against the rebel Chih Yiu and his army in 2697 B.C.E.) During these matches, the combatants reportedly wore horned helmets that they used to gore their opponents while using a primitive form of grappling. This early style of combat was first called Jiao Ti (butting with horns). Throughout the centuries, the hands and arms replaced the horns while the techniques increased and improved. The name Jiao Ti also changed over time, both through common usage and government decree. The first documented evidence of wrestling in Egypt appeared circa 2300 B.C.E., on the tomb of the Old Kingdom philosopher Ptahhotep. During the period of the New Kingdom (2000-1085 B.C.E. ), additional Egyptian artwork (often on friezes), depicted Egyptian and Nubian wrestlers competing. Carroll notes striking similarities between these ancient depictions and those of the modern Nuba wrestlers. On the 406 wrestling pairs found in the Middle Kingdom tombs at Beni Hasan in the Nile valley, nearly all of the techniques seen in modern freestyle wrestling could be found. During the period of Ancient Greece (about 1100 to 146 B.C.E. ), Greek wrestling was a popular form of martial art in which points were awarded for pinning a competitor by stretching the opponent prone to the ground or touching his back to the ground, forcing a competitor to submit or by forcing a competitor out of bounds (arena). Three falls determined the winner. It was at least featured as a sport since the eighteenth Olympiad in 704 B.C.E. 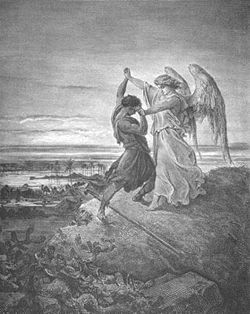 Wrestling is described in the earliest celebrated works of Greek literature, the Iliad and the Odyssey. Wrestlers were also depicted in action on many vases, sculptures, and coins, as well as in other literature. Other cultures featured wrestling at royal or religious celebrations, but the ancient Greeks structured their style of wrestling as part of a tournament where a single winner emerged from a pool of competitors. Greek mythology celebrates the rise of Zeus as ruler of the earth after a wrestling match with his father, Kronos. Both Herakles and Theseus were famous for their wrestling against man and beast. Late Greek tradition also stated that Plato was known for wrestling in the Isthmian games. This continued into the Hellenistic period. Ptolemy II and Ptolemy III of Egypt were both depicted in art as victorious wrestlers. After the Roman conquest of the Greeks, Greek wrestling was absorbed by the Roman culture and became Roman wrestling during the period of the Roman Empire (510 B.C.E. to AD 500). Arabic literature depicted Muhammad as a skilled wrestler, defeating a skeptic in a match at one point. By the eighth century, the Byzantine emperor Basil I, according to court historians, won in wrestling against a boastful wrestler from Bulgaria. In 1520, at the Field of the Cloth of Gold pageant, Francis I of France threw Henry VIII of England in a wrestling match. In Henry VIII's kingdom, folk wrestling in many places was widely popular and had a long history. In particular, the Lancashire style may have formed the basis for Catch wrestling also known as "catch as catch can." The Scots later formed a variant of this style, and the Irish developed the "collar-and-elbow" style which later found its way into the United States. 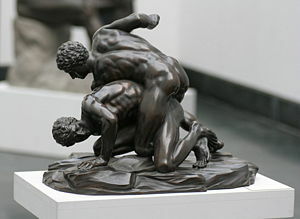 The French developed the modern Greco-Roman style which was finalized by the nineteenth century and by then, wrestling was featured in many fairs and festivals. Because of that and the rise of gymnasiums and athletic clubs, Greco-Roman wrestling and modern freestyle wrestling were soon regulated in formal competitions. On continental Europe, prize money was offered in large sums to the winners of Greco-Roman tournaments, and freestyle wrestling spread rapidly in the British Isles and in the United States after the American Civil War. Professional wrestling soon increased the popularity of Greco-Roman and freestyle wrestling around the world with such competitors as Georg Hackenschmidt, Kara Ahmed, Paul Pons, Stanislaus Zbyszko, William Muldoon, and Frank Gotch. When the Olympic games resurfaced at Athens in 1896, Greco-Roman wrestling was introduced for the first time. After not being featured in the 1900 Olympics, sport wrestling was seen again in 1904 in St. Louis; this time in freestyle competition. Since then, Greco-Roman and freestyle wrestling have both been featured, with women's freestyle added in the Summer Olympics of 2004. Since 1921, the International Federation of Associated Wrestling Styles (FILA) has regulated amateur wrestling as an athletic discipline, while professional wrestling has largely become infused with theatrics. The term wrestling is an Old English word that originated some time before 1100 C.E. It is perhaps the oldest word still in use in the English language to describe hand-to-hand combat. The Merriam-Webster online dictionary defines wrestling as "a sport or contest in which two unarmed individuals struggle hand-to-hand with each attempting to subdue or unbalance the other." Wrestling disciplines defined by FILA are broken down into two categories: International wrestling disciplines and folk wrestling disciplines. According to the International Federation of Associated Wrestling Styles, there are five current international wrestling disciplines acknowledged throughout the world. They are Greco-Roman wrestling, freestyle wrestling, Sambo (martial art), Grappling and Beach wrestling. Greco-Roman is an international discipline and an Olympic sport. "In Greco-Roman style, it is forbidden to hold the opponent below the belt and to actively use the legs in the execution of any action." Recent rule changes have increased the opportunities for "high amplitude" throws. One of the most well known Greco-Roman wrestlers from the United States is Rulon Gardner. Freestyle wrestling is an international discipline and an Olympic sport. "In free style, it is allowed to hold the legs of the opponent, to make trips and to use actively legs on the execution of any action." It is thought to have originated from English catch wrestling, and is currently the international style in which women participate in competition. Sambo is a martial art that originated in the Soviet Union (particular Russia) in the twentieth century. It is an acronym for "self-defence without weapons" in Russian and had its origins in the Soviet armed forces. Its influences are varied, with techniques borrowed from sports ranging from the two international styles of Greco-Roman and freestyle to boxing, judo, jujitsu, European styles of folk wrestling, and even fencing. The rules for sport sambo are similar to those allowed in competitive judo, with a variety of leglocks and with over 5,000 defense holds from the various national wrestling styles in the Soviet Union, while not allowing chokeholds. "Grappling, also called submission wrestling, refers to the gripping, handling, and controlling of an opponent without the use of striking, typically through the application of various grappling holds and counters to various hold attempts. Grappling can be used in both a standing position, where it is known as stand-up grappling, and on the ground, where it is known as ground grappling. Grappling is an essential part of both clinch fighting and ground fighting." Grappling is also used to describe the skills used in mixed martial arts competitions, differing from the FILA definition. Apparently in a bid to give wrestling greater appeal to television audiences, FILA adopted beach wrestling as an official discipline during 2004-2005. Beach wrestling is standing wrestling done by wrestlers, male or female, inside a sand-filled circle measuring 6 meters in diameter. There are only two weight categories, heavy and light. The objective is to throw your opponent or take your opponent to his or her back. The wrestlers wear swimsuits rather than special wrestling uniforms. Wrestlers may also wear spandex or athletic shorts. 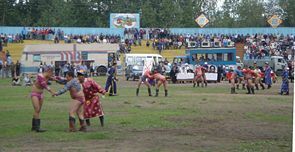 There are almost as many folk wrestling styles as there are national traditions, because folk wrestling describes a traditional form of wrestling unique to a culture or geographic region of the world. Folk wrestling styles are not recognized by FILA internationally. The following list provides examples of wrestling systems that fall into this category. Two high school students competing in collegiate wrestling. Collegiate wrestling (sometimes known as scholastic wrestling or folkstyle wrestling) is the commonly used name of wrestling practiced at the university level in the United States. A very similar style is practiced at the high school and middle school levels. The term is used to distinguish the styles of wrestling used in other parts of the world, and for those of the Olympic Games: Greco-Roman wrestling and Freestyle wrestling. There are currently several organizations which oversee collegiate wrestling competition: Divisions I, II, and III, of the NCAA, NJCAA, NAIA, and the NCWA. Division I of the NCAA is considered the most prestigious and challenging level of competition. A school chooses which organization to join, although it may compete against teams from other levels and organizations during regular-season competition. The collegiate season starts in November and culminates with the NCAA tournament held in March. Wrestling has gained respect among martial arts practitioners, especially with the advent of mixed martial arts competition. Early competitions (e.g. UFC 4 & 5) saw wrestlers defeat stylists from more traditional, striking-oriented styles such as karate and kickboxing. Randy Couture (current UFC heavyweight champion) and Dan Henderson (current PRIDE champion in both the 183 and 205 pound divisions) both competed extensively in collegiate and Greco-Roman wrestling before beginning their careers in mixed martial arts. Other fighters coming from wrestling are: Matt Lindland, Matt Hughes, Sean Sherk, Urijah Faber, Tyson Griffin, Kevin Randleman, Mark Kerr, Don Frye, Mark Coleman, Brian Vettel, Tito Ortiz, Quinton Jackson, Rashad Evans, Jeff Monson, Matt Horwich. Many other prominent and successful fighters began their training in various forms of wrestling, and fighters from non-wrestling backgrounds often pursue wrestling training to complement their other skills. Professional wrestling has grown in popularity over the past decade. The basis for its growing popularity is not confined to simply wrestling. The main professional wrestling league is the World Wrestling Entertainment (WWE), formerly known as the World Wrestling Federation (WWF). Professional wrestling most closely resembles a soap opera, with well-defined characters that play to the audiences' emotions. The violence is rampant; while much of it appears to be scripted, with combatants hitting each other with metal chairs and slamming through tables. Professional wrestlers such as the Rock (Duane Johnson) have forged their way into the television industry simply due to their popularity. The WWE has taken its act to global boundaries, even having a WWE Japan, Frankfurt, Australia, and so on. Position—This term refers to your position in relation to your opponent. Being in a good defensive position is the most important skill in wrestling. Getting your opponent out of a good defensive position is the one thing that must first be accomplished to penetrate into your opponent. Bottom/Down—You are under your opponent and he is in control of you. If you gain the neutral position, then you have "escaped." If you gain the Advantage/Top position then you have "reversed" your opponent. Advantage/Top—You are on top and in control of your opponent. In "folkstyle" wrestling, this is the only time points are awarded. A defensive wrestler must score an "escape' or "reversal" in order to score points, except for illegal holds or for stalling. Stance—Being in a proper stance is essential in wrestling. It most commonly applies to the neutral position, but is also applicable in the bottom and top positions. Square Stance—This means that your feet are even in alignment when you are in a standing position. Staggered Stance—This means that one leg is farther forward than the other foot. Squat Back Stance—A stance used in the down/bottom position in wrestling. Your knees and hands are as close to the lines as possible, with your hips sitting down on your heels. Tabletop Stance—A stance used in the bottom position. Thighs are essentially perpendicular to the mat, and your back is parallel to the mat like a "tabletop." Violation of Position—This can apply to the Neutral, Top, and Bottom positions. There are certain positions, which are correct, and certain positions, which are incorrect. An incorrect position prevents you from defending actions by your opponent. Hand Control—This means that you are holding one or both of your opponent's hands with your hands. It is generally preferable to grab your opponent's hand instead of his wrist. There are occasions when it is preferable to grab his wrist. Elbows In—This maneuver is executed by keeping your elbows aligned with your body; however, it does not necessarily mean that your elbows are against the side of your body. High Leg Over—When you are in the top position, there will be times that you need to turn your hips towards the ceiling temporarily. By stepping one leg over the other and putting your foot to the mat, you are executing a "High Leg Over." Two on One—This means gripping an opponent's hand, wrist, or arm with both of your hands. Bridge—Forming an arch "Bridge" with your back and legs, by supporting your body with only your head and feet on the mat. Chop—This usually means to pull the opponent's near elbow towards the mat. Step and Slide—This is how your move your feet in a circle or laterally. You step sideways with one foot (this is a small step usually 6" to 1', you then slide your other foot to keep an even distance between your feet. Back Heel—This can be done from the neutral and top position. In the neutral position it means stepping your foot outside and placing it behind the opponent's foot. In the top position this usually occurs with your opponent in a standing position, with you standing behind him with your hands locked around his waist. You place one of your feet behind his heel, and then pull him over the foot you've blocked. Limp Arm—This is a method to release an opponent's overhook/whizzer when you are in the neutral or top position. Rip Back—This means you take the opponent's head backwards over his hips by rolling over your own when you are at a 90-degree angle to the opponent. Underhook—A form of tie up in the neutral position. You drive your hand and forearm inside your opponent's arm, and raise your hand and forearm up under the opponent's shoulder. Crossleg—This means' reaching under the opponent's chest/stomach and grabbing the knee/calf of the far leg. Crossface—This will drive the opponent's head away from you, by pushing his head with you're the bicep portion of your upper arm to the side of his head. This is used typically to counter leg takedown attempts, and on top to apply a crossface or far side cradle. Swisher—To swing your feet away (like a windshield wiper blade action) from your body when in a squat back or tabletop stance. Belly Down—This means put your belly so it faces or is on the mat. -You are about to be reversed, therefore let him go and give up only 1 point. -You are about to be called for stalling because you can't break your opponent down. This action will save a penalty point, which you may be able to make up by scoring a takedown. If you don't let him go you'll be penalized, then if he escaped he has scored 2 points instead of the one you gave up when you "cut him loose." Trap—To hold a part of the opponent's body with part of your body. You may "trap" or squeeze his head with your knees, trap an arm by squeezing your elbow to your side, and so on. Flanker—When in the top position this means you take a foot and calf of your leg and place it inside your opponent's leg. If you use your outside leg it is an outside flanker, which is the most commonly used type of flanker. If you use the inside leg, it is usually because the opponent stepped over your near leg. Double Top Stretcher—You overhook both of your opponent's legs below the knees while in a chest-to-chest position. Many high school wrestlers refer to this as a "Saturday Night Ride." Daylight—This refers to the distance between you and your opponent. Defensively you want to create daylight; offensively you want to eliminate daylight. Turn the Corner—This means going from a head-to-head alignment to a 90-degree or less angle to your opponent. It means you will wind up to one side of the opponent. Back Door—To go between the opponent's legs from in front until you are behind him. Block—To keep a certain part of the opponent's body from moving. For example, blocking the opponent's foot, and driving or pulling his body over that foot will cause him to lose his balance. Whizzer—This is the same as an overhook of the opponent arm from the front or when you are parallel to him. Straight-line Defense—This mean's you keep your body on the same alignment as the opponent's, only your body is above his body. This is a means of stopping his penetration on a leg takedown attempt. Hopefully you will be able to stop his penetration, get him extended, and score a takedown by getting behind him. Pinch Head Lock—Secure and underhook with one arm, and grab the opponent' s head in a "collar tie" lock your hands together, place your forehead in the opponent's temple. After doing this simply drive him down to the mat and onto his back. ↑ 1.00 1.01 1.02 1.03 1.04 1.05 1.06 1.07 1.08 1.09 1.10 Michael B. Poliakoff, "Wrestling, Freestyle," Encyclopedia of World Sport: From Ancient Times to the Present, eds. David Levinson and Karen Christensen (Santa Barbara, CA: ABC-CLIO, Inc., 1996). ↑ Sacred Texts, The Mahabharata. Retrieved January 15, 2009. ↑ Benny Peiser, "Western Theories about the Origins of Sport in Ancient China," Sports Historian (16): 117-139. ↑ Scott T. Carroll, "Wrestling in Ancient Nubia," Journal of Sport History 15 (2): 121-137. ↑ Historical Pankration, Wrestling. Retrieved January 15, 2009. ↑ International Federation of Associated Wrestling Styles, Greco-Roman Wrestling. Retrieved August 9, 2007. ↑ Dictionary.com, Wrestling etymology. Retrieved January 15, 2009. ↑ Merriam-Webster, Wrestling. Retrieved January 16, 2009. ↑ Thesaurus, dictionary.reference.com American Psychological Association (APA): wrestling. Retrieved March 23, 2007. ↑ FILA, International Federation of Wrestling Styles. Retrieved January 16, 2009. ↑ FILA, Freestyle definition. Retrieved January 15, 2009. ↑ FILA, FILA-Sambo definition. Retrieved January 15, 2009. ↑ FILA, FILA-Grappling definition. Retrieved January 15, 2009. ↑ FILA, Beach Wrestling Rules. Retrieved January 15, 2009. ↑ Gary Mihoces, Wrestling's New World Rises from Sand, USA Today. Retrieved January 15, 2009. ↑ Erich Krauss, Warriors of the Ultimate Fighting Championship (Citidel Press, 2004, ISBN 0806526572). Poliakoff, Michael. "Wrestling, Freestyle." In Levinson, David, and Karen Christensen (eds. ), Encyclopedia of World Sport: From Ancient Times to the Present. Santa Barbara, CA: ABC-CLIO, Inc., 1996. ISBN 0874368197. Poliakoff, Michael. "Wrestling, Greco-Roman." In Levinson, David, and Karen Christensen (eds. ), Encyclopedia of World Sport: From Ancient Times to the Present. Santa Barbara, CA: ABC-CLIO, Inc., 1996. ISBN 0874368197. World Wrestling Entertainment. Homepage. Retrieved October 22, 2016. This page was last modified on 22 October 2016, at 15:09.